If you have multiple children then you have probably heard the whining and crying of the younger child who just isn’t able to play board games with his or her older siblings. I know I have, and I get the frustration they feel because the board games are too advance for them to understand nor play along with. But there are some great board games for preschoolers now, games that older siblings can play along with too. We have a good sized collection of games for our family. I say family in particular because Hubby and I have had a few of them since before we had kids. I always feel good about buying games over toys because they’re something that we can do together as a family quite often, and they are great for those days when I don’t want to do school lessons. Board games are great for practicing math and reading skills. Boggle Jr. – a specially designed Boggle game that helps preschoolers learn their ABC’s! Boggle Jr.’s easy matching games teach them letters, spelling and reading-while they’re having fun! Flying Bee Games – This game is fun, colorful and full of preschool sized action. Your kids are going to be working on their hand-eye coordination to make sure those bees don’t get your honey! Connect 4 – I always loved this game! It’s simple rules and set up make it the perfect addition to your game collection because kids (and adults) of all ages can play it. Get to 4-in-a-row, is the first to win! Diggin’ Doggies – Oh no! Your doggie has lost all of his bones! Help him find them and bring them back to his dog house. Be the first to help your doggie collect all of his bones and you win! Wooden Tetris Puzzle – I loved Tetris growing up, and I still love it. So this game is really awesome. It’s a sturdy, colorful and ultra-fun wooden block puzzle for your preschooler. It’s a one child game, which I have really come to love with my preschooler. He has something to do while his sisters play a harder game or work on schoolwork. Candy Land – A classic favorite, this enhanced classic candy land game features delicious-sounding destinations and sweet adventures. Let’s Go Fishin’ – This game has been around for forever! Hungry Hungry Hippo – Have a chompin’ good time with the hippo-feeding Hungry Hungry Hippos game. Hungry Hippo and his pals are ready to join in the feeding frenzy. Perfection – I’ll be honest, I’m still not 100% sure what this game is, but my preschooler LOVES it! Try to get all the pieces in their place before the time runs out. Hand eye coordination is really getting worked on here. Disney – Eye Found It! – This is a fun, relaxing game to sit on the floor and play. It has so many of our favorite characters hidden to. 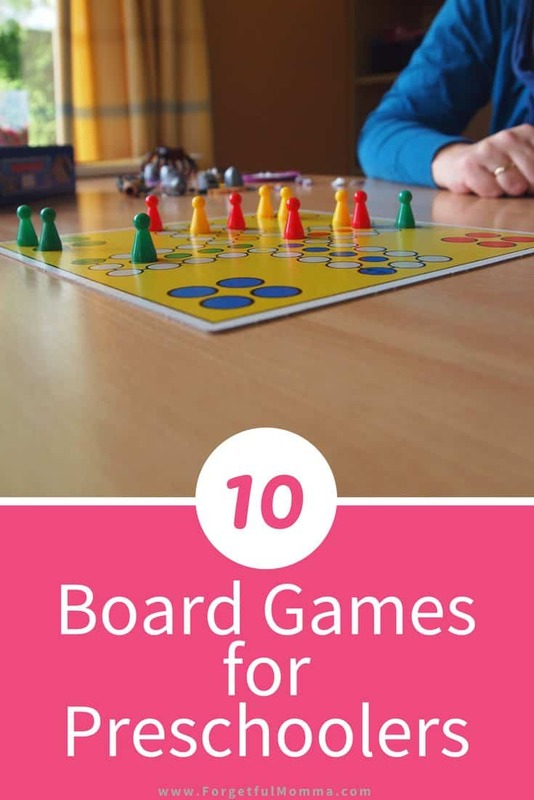 If you’re looking for board games for your school aged children (5-10 years old) check out this post where I shared some more of our favorite games. <— Coming soon!! I’m always trying to figure out what games I can play with my small grandchildren. Thank you for sharing this post at Over the Moon.